I saw my first Harvey Joiner painting at the Higgins-Maxwell Gallery in Louisville, Kentucky in 2004, when Bob Higgins showed me the one he had for sale there. I forget exactly which picture it was—rather a typical woodland scene, painted with real sensitivity if not terrific expertise. Seeing it reminded me of my coming upon Albert Pinkham Ryder's pictures for the first time, at what is now the Smithsonian American Art Museum in Washington, D.C.: Here was someone with something to say who would not be impeded by lack of training or technique. Picqued, I looked into Joiner's life, and was surprised to find that, despite his continuing regional prominence—and, at his death, a national reputation—hardly anything had been published about him, not so much as an article. I conceived the idea of writing his biography, and set about beginning the research. I've enjoyed doing library research ever since, in 1981, an independent study course with the late Prof. Norman Kelvin at New York’s City College introduced me to it. Every semester he used to take on a few students in hopes of getting some help with his gargantuan project: He was then in his twenty-second year of collecting and annotating materials for The Collected Letters of William Morris (Princeton University Press, four volumes, 1984-1996), and at that time was still three years away from publishing Volume One. Prof. Kelvin gave me queries that took me to the New York Public Library, Butler Library and the Avery Architectural Library—daunting institutions all. I still remember my first week’s findings, magazine articles from the 1860s having to do with Sir Austen Henry Layard’s gift of massive Assyrian stone reliefs to his in-laws for their country seat, Canford House. This was off topic for the particular queries I was supposed to be pursuing, but caught my eye because the owners of Canford House were relatives of Caramoor’s Mrs. Lucie Bigelow Rosen, a longstanding object of my obsession (see my books I Remember Caramoor, My Mad Russian and Another’s Fool.) (In 1992 Canford School, which now occupies Canford House, was amazed to discover that these reliefs weren’t plaster casts, as it assumed, but rare originals (I could have told them that! ), and promptly sold them for more than $10 million.) Anyway, soon I was conducting more on-point researches, and achieving gratifying results. At the end of the semester Prof. Kelvin put me on his project’s payroll. Though it was part-time, and the money laughable, there I happily mostly stayed through 1994. It’s an honor to have been Prof. Kelvin's research assistant, an honor to have helped add to our knowledge of William Morris—a truly protean figure—and a delight that our edition of the Letters is the best researched of anybody's collected letters, bar none. 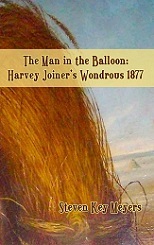 Well, Harvey Joiner proved a different matter than Morris, of course. But however minor an artist, he’s a genuine one, with much to say about his times and place, and I enjoyed getting to know his lively personality and his work. I hit various veins that turned up rich ore—particularly the microfilm collections of Louisville newspapers and those of his native Clark County, Indiana. The man lived to get his name in the papers, and fortunately for me frequently succeeded. Joiner's style developed rapidly from an attractive early naivete to the sophistication of Ruth Gleaning in the Fields of Boaz; that remarkable, beautiful and important picture represents perhaps the high point of his artistry. But he never painted a woodland scene that didn't add something no other had; though seldom credited with it, he was actually an artist of integrity. It was a particular delight to meet the late Mrs. Julia Van Winkle and hear her tell of spending several days with Joiner in his studio as a little girl in the 1920s, watching him choose a canvas from those on the floor leaning against the walls, place it on his easel and touch it up before choosing another, then knocking off to take her with him to the races at Churchill Downs. Though my hope was to write Joiner’s biography, I needed financial support to do so, so circulated an account of Joiner’s notable year of 1877—the kernel of the present book—to try and drum up some interest. To my dismay, it elicited none. No one wished to mount a Joiner exhibition, as was my suggestion, and in fact derisory remarks came back from such places as the Filson Club and the Speed Art Museum; the latter's former chairman, the late John Speed, grandfather to my niece and nephew, told me he too had tried over the years to promote Joiner there, to no avail. Hence, this little book. It's my hope that from time to time I can write up further bits of Joiner's life, including how an early family connection to a general’s widow might have helped single him out as a backwoods youth of promise and his sudden 1890 move to Pittsburgh, Pennsylvania. A liability of writing about the region's historical figures is that so many of them were racists through and through. Joiner appears not to have been one of them, however; he and his mother apparently belonged to the Jeffersonville Christian Church congregation whose minister once singlehandedly talked down a lynch mob. In his old age, living in the fine brick house in Clarksville he built for his daughter and her family, Joiner used to attend his son-in-law's barbecues, where the guests included the son-in-law's black colleagues from his job recapping tires in a Louisville garage; the gales of rich African-American laughter wafting through the glades of what was then (and through the 1960s remained) a "sunset" town entered family lore, according to Joiner's great-granddaughter Ruth Emily. (Of course, mystery remains as to why Joiner's son-in-law worked at a menial job when his father was rich, a partner with his brothers in the Lewman construction firm well known for building courthouses across the South, including that in Monroeville, Alabama, made famous by To Kill a Mockingbird). But some of Joiner's associates and friends were among the worst of the worst; one friend sold portions of the ropes used to hang three black men accused of theft, in a notorious Clark County lynching instigated by Joiner's acquaintances, the grandfather and uncles of beloved Col. Harland Sanders. I hope somebody someday has the fun of writing Joiner’s full-length biography, and I’m only sorry it won’t be me.